There will always be circumstances beyond your control that can affect your business. Preparing for the worst can minimize the risk. A disaster is an event that would cause the inability to continue your normal business operations. Fortunately, these situations are rare, but overall billions of dollars have been on the repercussions of natural disasters. Not to mention all the revenue businesses have forgone while recovering from the disaster and getting their operations back up and running. Indirect disasters can also be devastating. These trigger a domino effect that can be felt through all members of your operations and supply chain. How would your business operations be affected if your biggest customer’s purchases were cancelled due to a disaster? How would your customers be affected if your biggest supplier was down and you were unable to get your supplies and merchandise to fulfill purchase orders? Know the value of your building, contents, and equipment. Review your business interruption expenses. Can you meet payroll, pay vendors, pay rent/mortgage, purchase equipment and supplies? Estimate the length of time it would take to rebuild or relocate to get the business functioning again. Mark your main water shut off valves and fire extinguishers for quick access. 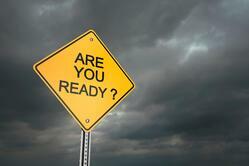 Discuss disaster planning with your management team. Be sure they know what steps each of them would be responsible for in the event of a disaster. Up to 40% of businesses never recover after experiencing a disaster. However, only approximately 30% of businesses have a disaster plan. Don’t be caught unprepared. Start planning today. Contact a Knowledge Broker to discuss how you can better protect your business in a time of crisis.